The Oneworld alliance has announced that Royal Air Maroc will become a full member in 2020. The move will bring the total number of full Oneworld members to 14 and open up valuable new options for award travel to Africa. 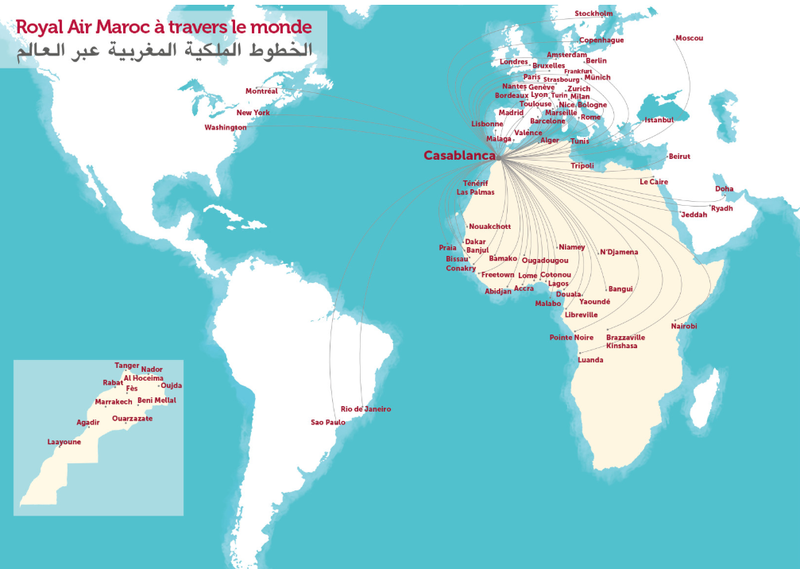 Not surprisingly for an African airline, Royal Air Maroc has an extensive network of destinations in sub-Saharan Africa. It also serves dozens of cities in Europe and the Middle East. Transatlantic flights are more limited, but the airline serves Washington, D.C., New York, and Montreal in North America as well as Sao Paulo and Rio de Janeiro in Brazil. Based on American Airlines' current award chart, there should be some solid deals on flights within Africa as well as between Casablanca and Europe or North America. Unfortunately, it won’t be possible to use Oneworld miles until Royal Air Maroc becomes a full member in 2020, and award prices could always change in the meantime. Over the last few weeks, there have been rumors that Alaska would be joining as a Oneworld Connect member. However, this detail was not confirmed at the alliance's year-end meeting in New York City as many had hoped. It's always good news for points and miles collectors when an alliance adds a member. The only disappointment is that we'll have to wait until mid-2020 to book awards with Royal Air Maroc. Hopefully, we'll see Oneworld continue to expand its membership in an effort to compete with the 27 members of its largest rival, Star Alliance. 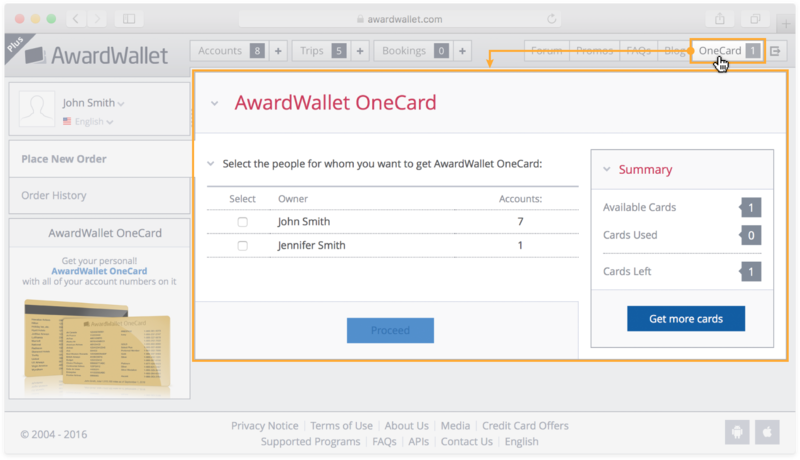 Did you know you can order an AwardWallet OneCard with up to 30 of your loyalty accounts printed on it? The card is only $10 and is shipped free of charge anywhere in the world. Great news! This will help me travel more in Africa. That’s probably why the QR CEO went nuts just weeks ago. I would concur on this!!! Good deal!!! Sounds like a real classy leader. That’s probably why the QR CEO went nuts just weeks ago. QR is increasing become redundant. It is a good transatlantic network addition. This is awesome news. Love seeing new partners to increase the value of alliances! Who has traveled on Royal Air Marco? Wishing it were Alaska instead or additionally. Maybe someday. I hope they still continue to allow etihad miles to be used for award travel. More is usually always better. Even if I never heard of them before. Can’t see any West African destinations I’d actually want to visit. But Brazil to CMN could open some interesting options. We need another intra-Europe member. I don’t know who though, but since the demise ofAirBerlin there are definite gaps. Sounds like a long wait to utilize this airline. While there’s something to be said for anticipation, it is disappointing that usefulness won’t begin for some time. That said, however, as happenstance would have it, we do have an Africa trip penciled in for 2020-2021, and could well make use of this new partner at that time. Always great to have more options. Good addition to the program. Seems like a long wait time to use them. This is one of the few carriers I’ve definitely never tried. But I’m open to it. More options are always nice, but it’s unfortunate they don’t fly to South Africa. OneWorld needs an African airline that flies to South Africa and the vicinity. Although not a Oneworld member, Comair is based in Johannesburg, and can be booked with British Airways Avios, so that may be a decent option to put your itinerary together. Not familiar with them, but it’s great to have more in the alliance. Looking forward to their inclusion. Limited options to Africa currently. This is excellent news because the airline brings so much more value to the alliance thanks to its destination list in Africa. The rumor also had it that they were planning to join Avios as well and if this is also true then I can’t be any happier! Always great to see new alliance partners! Since Royal Air Maroc won’t be a full member until 2020 it gives me time to build up miles for a trip to sub-Saharan Africa! Might help me get to Morocco on American miles sooner than I thought! Thanks for showing the route map of their destinations. This certainly opens up a different area of the world for us to potentially explore using our points. More partners in the alliance is always better. I think Alaska would like to stay out of the alliance game in the foreseeable future. Does Royal Air Marco run enough flights on any given route to make the network valuable? I suppose that depends on whether you have any flexibility in your travel dates. A lot of their routes are daily, so there should be plenty of good opportunities. Good news, but unfortunately it won’t come soon enough for my trip to West & North Africa next year. I have a few flights planned on their airline and plenty of AA miles to burn. … like 3 flights a day? Back in the day, in the 1970s, without the hub concept, alliance, Cathay ran 3 flights a day to key Asian destinations for breakfast, lunch and dinner. The airline’s hub in Casablanca is not one you want to connect through. The airport has no jetbridges, so pack carryons light to tackle the long flight of stairs to/from the tall plane! Counters, security and gate operations are disorganized. Airport computer systems and wifi are frequently down. Entertainment inside the airport is sparse. Shops are absurdly over-priced. Business lounge customer service and food offerings are weak. If one is looking to connect to Africa, airports in Europe or Middle East are better options. More competition between the major alliances is always positive. I feel like Star Alliance redemption options have gone downhill, so this is welcome news. This is good news, but it is a long way off! Thank you for the report, Belgian. I was impressed with their route map. I have seen their aircraft in Europe but never knew they were that large. Good pickup for the alliance but more interested in Alaska Air. Nice to have another partner in the OneWorld alliance even though we need to wait almost two years. You never know when this’ll come in handy! Finally more options for North Africa . Hopefully the charts wont change for the worst by mid 2020 . I wish there were a few more European airlines joining Oneworld. The demise of airberlin has left a huge gap. There don’t seem to be any likely candidates though. That airline needs a rebrand. It nice to see they are adding a partner, just one that I would not need. Here’s hoping that Alaska becomes a partner! Since Alaskan hasn’t joined an alliance yet, I believe, so I don’t know if I see them joining Oneworld. 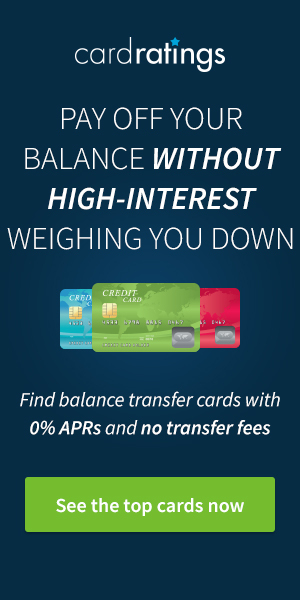 I’m hoping that American sees that a credit card transfer partnership would be good for themselves! Oneworld finally has some usefullness for Africa. Let’s hope that there will good connections to Europe and Asia. It can be tough to get to Africa in a timely manner if you’re not on the East Coast. This will be a welcome addition to the sparse offerings. Great news for connections from Europe to Africa. Significantly, RAM still gives mileage based on distance, not the fare paid – which makes it much more lucrative mileagewise. I just flew RAM from Rio and got the full mileage for the cheapest available fare. And a row of seats on coach. And two coach dinners. Lol. The J seats on their 787 doesn’t look too bad… so this may be good news. I live in an AA hub. 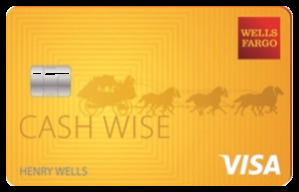 This will make award tickets to Africa easier. Royal Air Maroc flies to my city. This is a great option to fly on OW for Germans like me after the exit of Air Berlin. Royal Air Maroc flies to Frankfurt and Amsterdam. Also very interesting is to get a good connection in the African country, which is very difficult except Ethiopian Airlines. This could be a very useful addition to OW. Currently, Iberia Avios and Etihad Guest points can be used to book Royal Air Maroc awards, which is easier said than done. They can’t be booked online and the phone reps at Iberia and Etihad are not the best. But I’ve noticed the availability is very good. If the same availability is present for OW, this would be nice. I would like to fly them at some point. Any idea when Aer Lingus will be joining Oneworld Connect? Great addition to one world. Morocco N Africa is worth traveling to or through.